There’s something to please everyone at Oxford Manor Apartments & Townhomes. 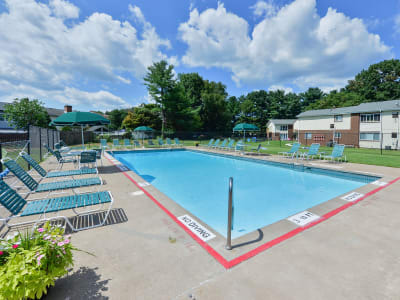 Located in Mechanicsburg, Pennsylvania, near Harrisburg, our spacious one, two, and three bedroom pet-friendly apartments for rent are handsomely equipped with great interior features and an inviting collection of community amenities. Imagine starting the day with a cup of coffee or tea on your private patio or balcony, enjoying views of beautiful landscaping and, from some homes, a sparkling swimming pool. After cleaning up from breakfast and starting a load of laundry in your convenient in-home washer and dryer, grab your pup and head down to the dog park for a day of agility training. Once the dog has been exercised, it’s your turn. The indoor fitness center features both cardio equipment and weight machines, so you’re sure to get in a good workout no matter your preferences. Ready to know more about the lifestyle that is waiting for you at Oxford Manor Apartments & Townhomes? Give us a call to schedule your personal tour.